Very quiet village: With a population of under 4,000 people, L’Hospitalet de L’Infant offer some of the quietest holidays of all holidays to the Costa Dorada. Many people come here for rest and relaxation amongst the serene green surroundings. L’Hospitalet de L’Infant: The historical site which the holiday resort is named after, L’Hospitalet de L’Infant is in fact a medieval hospital which was built in 1191. You can still see the flat, square design and the dusky beige cobbled walls which belie its age. The hospital was built to shelter pilgrims and travellers, and was named after Peter IV (often nicknamed as ‘L’Infant’) whose mother instituted it. 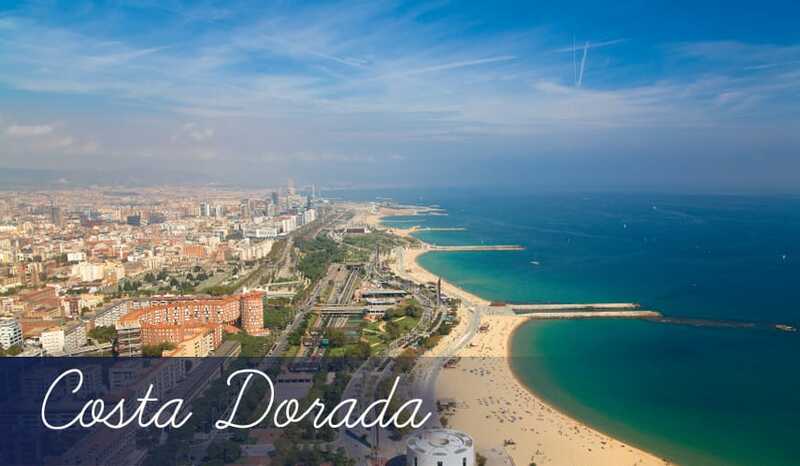 The attraction is a must-visit on your holidays to L’Hospitalet de L’Infant – after all the resort is named after it! Bonmont Golf Course: One of the best golf courses in Spain, Bonmont hosted the Catalan 1991 and 1996 tournaments. With a golf course of this reputation, as you can imagine the greens are kept pristine and there are several beautiful water features and over ninety bunkers. The golf course itself was designed in 1990 by Robert Trent Jones Jnr and has been enjoyed by many golfing greats such as Jose Maria Olazabal and Paul Lawrie. De l’Arenal Beach: The beaches in Hospitalet de l’Infant are quite striking not only for their long stretches of light golden sand against pine-clad mountains, but also because they have a quiet, unspoilt atmosphere that makes them even more impressive. De l’Arenal is one such beach, where you can be sure you’ll be free to enjoy its tranquil environment and turquoise waters on beach holidays here. Cala d’Oques: Another quiet beach in much the same style as Arenal. At only 260m long, Cala d’Oques is much smaller though, and it’s surrounded by sweet-smelling pines. You’ll also appreciate its soft golden sand and peaceful ambience. It’s a blissful place to spend your holidays in L’Hospitalet de L’Infant. El Bistro Restaurante: A warm welcome awaits you in this cosy bistro. Run by an enthusiastic German family, this restaurant serves homely European food with rich delights such as steak with blue cheese and a tomato and herb sauce. Or maybe you might prefer the deliciously smooth and creamy pea soup. Restaurant Alhambra: Here’s a novel setting for your evening meal: inside a 15th century hospital! The Mediterranean menu adds to the majesty of your surroundings with a choice of grilled meat, fragrant rice and an extensive wine list. It’s a very special eatery to treat yourself to fine food on your holidays to L’Hospitalet de L’Infant. Bar Safari Restaurant: This contemporary restaurant also doubles up as a bar. Thankfully, it’s not all about the drinks here though, as they also serve an interesting selection of Spanish and French-inspired meals, plus fresh seafood and sushi. Restaurant/Bars: Holidays to L’Hospitalet de L’Infant are rather quiet, so there are only a few bars within the area. Most of them double as both restaurants and bars, but they’re certainly more than adequate for an enjoyable evening. We’d recommend Bar Safari, Miguel and Casa Paco as traditionally Spanish venues where you can wash tasty tapas down with a few crisp, cool beers. And if you don’t fancy having a meal in Alhambra, you could always just pop in to enjoy the fabulous setting with a couple of cocktails instead. Independent boutiques: Being such a small village, there aren’t many shops in L’Hospitalet de l’Infant. However, you will find some interesting boutiques and quirky independent shops. A great example of this is Duna Textil, it supports national labels like Smash – a contemporary fashion brand born in Barcelona.